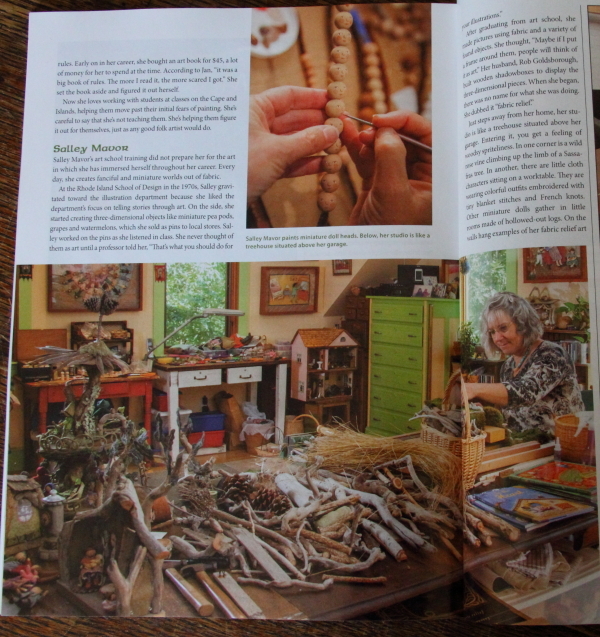 I am happy to show pictures from a story about my work that has just come out in the March issue of Cape Cod Magazine. Last week, a woman showed me her copy, after I gave a lecture down Cape to the Bayberry Quilters. She had the magazine because there’s an article about her roller derby club in the same issue, which I think is pretty cool. A couple of women from my Zumba class this morning mentioned seeing the article, so I tried again and found some copies at the drug store. The photographer, Dan Cutrona took the photos in my studio last fall when I was working on doll projects and setting up scenes for the revision of Felt Wee Folk. I think he did a good job of capturing the essence of my artwork and work place. This entry was posted in Dolls, Studio, Wee Folk by Salley Mavor. Bookmark the permalink. I’d love to get a copy too…will have to access their website to see if they would mail me one. Great article from what I could tell..colorful and full of life! Hope all is well…thanks again for sharing since your blogs help to brighten this long winter. Another storm is on its way to NE PA but maybe it won’t bring too much, hopefully. We are blessed to have plenty of water though, and not the worry of the CA droughts, now being followed by torrential rains and mudslides. We count our many blessings, and you are one indeed! Wow! You sure have been getting a lot of press these past few years. From what I can tell from your blog it looks like it is good article with lots of photos. Hopefully I will be able to find the magazine at my local bookstore since I live in Eastern Massachusetts. Salley I am so thrilled for you! 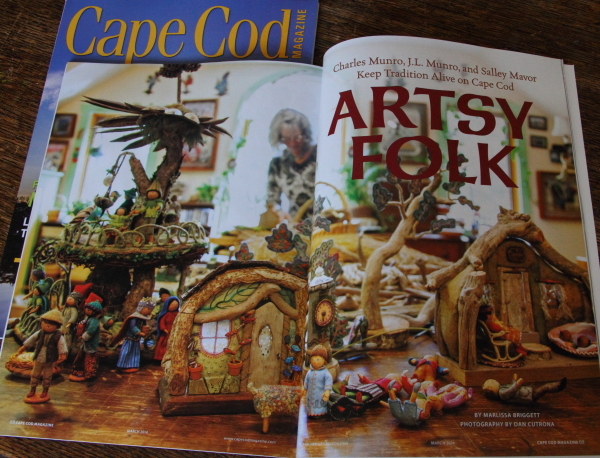 I too like so many others will be ordering a copy of Cape Cod Magazine. The photos are so Beautiful!! I also posted a comment on the Facebook page of the magazine Where Women Create in hopes that they too will consider you for their magazine. Rebecca, thanks so much for continued support and for helping to spread the word! What a wonderful article and photo layout! I need to get this magazine! 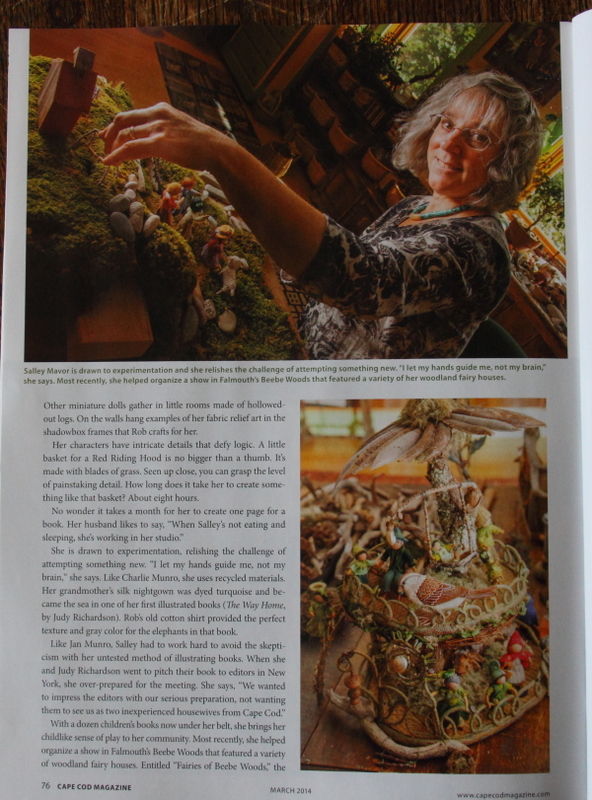 And there is also a nice article in the March/April 2014 issue of The Horn Book Magazine, which focuses on Picture Book illustration. Hooray! I wish i was back in Cape Cod to read the article. The photos look wonderful.